The Low-Down: Where's Our Electric Pickup Truck? Where's Our Electric Pickup Truck? One in every six vehicles bought in the United States is a pickup truck. Ford’s F-series truck has been America’s best-selling car for 35 years, shifting 500,000 units so far in 2017. America’s second most popular car is also a pickup truck. And its third. Although sales of electric vehicles are soaring, with 105,000 plug-in vehicles sold by August this year —- a 35% increase over 2016 — car manufacturers have yet to put an electric truck on the road. Americans no longer face a lack of choice when choosing an electric car — unless, that is, they want a pickup truck. Although sales of electric vehicles are soaring, with 105,000 plug-in vehicles sold by August this year —- a 35 percent increase over the same period in 2016 — car manufacturers have yet to put an electric truck on the road. 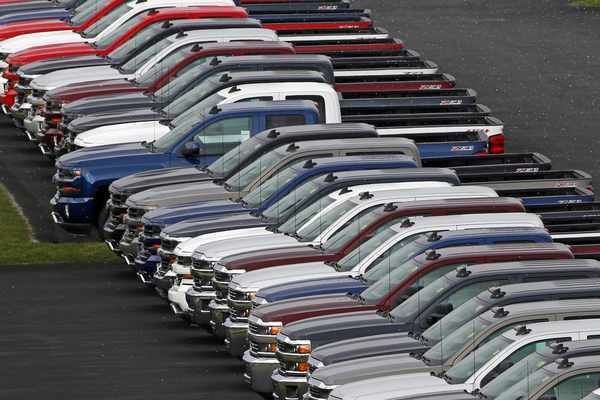 One in every six vehicles bought in the United States is a pickup truck. Ford’s F-series truck has been America’s best-selling car for 35 years, shifting 500,000 units so far in 2017. America’s second most popular car is also a pickup truck. And its third. Tesla's chief executive Elon Musk announced his intention to launch “a new kind of pickup truck” in July 2016, as part of his master plan for the company. He has tweeted he would unveil the new design by April 2019. He’s not the only one to get in the game, with several other start-ups announcing plans to launch an electric pickup in the next few years. Workhorse says it will go into production on its W-15 truck in late 2018, initially selling to fleet operators with a consumer version to launch shortly after. It has 5,000 preorders. Havelaar Canada says its electric pickup, the Bison, will come onto the market in 2020 or 2021. Via Motors anticipates putting an electric pickup on the road in the next two years. Other companies proposing an electric truck include Bollinger Motors and EV Fleet. Even Ford has said it plans to roll out a hybrid F-150 pickup by 2020, although an all-electric version remains off the radar for now. “Running on electricity is perfect for pickups. It makes the truck a more complete work station where you can plug in all your tools, including your power tools — even your arc welder. People have been denied the choice of an all-electric pickup truck and we want to make it right,” Havelaar Canada said in an emailed statement. So why has the idea been so slow to catch on? Launching an electric pickup truck comes with its own set of difficulties, which manufacturers have attempted to address as they bring the models to market. Pickup trucks are equipped to deal with heavy loads and tough terrain, and are designed for functionality and reliability. Perhaps the most pressing issue is how far their vehicle can travel before the battery runs out. “It's range anxiety on steroids, because suddenly you're towing something or you've got a big load on the back,” Steve Burns, the chief executive of Workhorse, said in an interview. He’s attempted to assuage these concerns with a gasoline range extender, allowing the truck to continue beyond its 80 to 100 mile electric-only range “so you never have to sweat,” he said. Improving batteries so that they can carry large loads for long distances is a challenge. Heavy batteries can take a toll on efficiency, as they have to draw on their own power to move themselves, as well as the vehicle. Tesla plans on cutting its teeth on this issue by launching its electric semi-truck in September, although experts have questioned how they will achieve this. According to a paper published this year by academics at Carnegie Mellon University, a battery powerful enough to drive a semi-truck 600 miles would require a battery that weighs more than the cargo, due to federal regulations limiting the gross weight of trucks to 40 tons. On a Tesla news blog, automotive expert Aaron Turpen has pointed to another potential safety issue: Off-road driving becomes difficult when there’s a huge battery under the vehicle. “With the problems the [Tesla] Model S has had in the past with undercarriage breaches on the highway, it’s easy to see concern when going fully off the road. Even the best of dirt roads are rough. Putting an under-pan, as Tesla has done may or may not work well with a truck,” Turpen wrote on Teslarati. Then there’s the cost. You can currently buy a Ford F-150 truck new for under $30,000. The Workhorse is selling for around $52,000, while the Havelaar Bison is expected to go on sale for $58,000 Canadian. Savings on gasoline over the truck’s lifetime, however, can help to offset the high upfront price tag. “When you take the long view like that, like fleet managers do, our vehicle is the least expensive pickup truck that you can own,” Burns added.This leaves the question of whether truck drivers will be willing to swap their gas guzzlers for a cleaner model that can’t roll coal. “Some people dislike electric vehicles because of who likes them. But many people simply appreciate the performance. I think the performance advantage of EVs overcome some of that cultural bias,” said Peter O’Connor, an energy analyst at the Union of Concerned Scientists. gallon compared to 40 mpg for a large car. Transport is currently the single largest source of emissions in the United States, overtaking the power sector in 2016. Increasing the efficiency of these high emitting vehicles could be the best way to reduce transportation emissions, according to a briefing released in May by the Baker Institute for Public Policy at Rice University. The paper found that, for every 100 miles, improving the fuel efficiency of a single Ford F-150 by 5 mpg would save the same amount of gasoline as a 6 mpg improvement to six Priuses. It also points out that the vehicle displaced by a truck driver upgrading to a more efficient pickup is likely to be dirtier than that displaced by a new Tesla driver, who probably already drove a pretty efficient car to begin with.